I am participating in the Blogging from A to Z April Challenge. 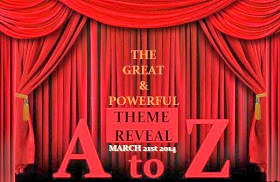 Today we are doing a Theme Reveal post hosted by our dear blogger friend Vidya Sury. This is my third stint at the A to Z April blogging challenge and I am as clueless as I was the first time. Today all my blogger friends are revealing their themes for the challenge, almost all of them have decided upon a structured theme, topics, flow of their posts for the entire month of April. Why then do I find it so hard to come up with a list? Why am I so incapable of making a concrete plan and sticking to it, it will definitely make life more comfortable and the challenge easier to tackle. I think I know the reason for my hesitancy; I was a breech baby and have always gone against the normal course of nature in life. Just today my friend told me something interesting while we were working on a project; she said, ‘You always choose the most difficult way to do things when there are simpler and more convenient ways available’. Maybe it is a flaw, or a condition, a conscious choice, jury is still out on this one. Maybe I look for problems and challenges subconsciously, I am not satisfied with easy, or maybe I am a glutton for punishment, whatever the cause may be, I love challenges and there can be no bigger challenge for a writer than a month-long blogging challenge. So I am leaving the list undone, unwritten, unrevealed for yet another year and hope to complete my challenge, successfully. Mysterious as you, Sulekha 😉 Will unravel it in April. And hey, can you configure your Tweet button to show your id? Easier to share. Thanks! I agree with Shailaja …Mystery is your theme…Looking forward to reading your posts! I wait eagerly for your theme Sulekha ! Hmm. Secret.. Would wait till I start reading your challenge posts. I have revealed my theme. Why don't you check it. I'm sure you'll do great in the Challenge! Here's to your success! Taking the road less travelled,that requirs wit and courage………..
by the way I'm one of the co-hosts assistants (Pammy Pams unconventional alliance) and thought I'd mention that your webpage link on your google profile took me to -http://sulekkha.blogspot.dk – while I'm glad you had a post up that led me here, it might be worth the effort to change the link for the #atozchallenge so other bloggers can find you easier. Freedom is your theme, Sulekha! Hugs! Your approach sounds a nice and laidback way to enjoy the challenge. First time for me to join in the A-Z, will look fwd to the reading. All the best. A breech baby? I can't even use that as an excuse! I don't like to do things the hard way as much as I like to live on the edge! But here's to us, Sulekha! I know you'll churn out fab posts! I did that last year and though I have a theme this year I'm really winging it. Look forward to your posts. Looking forward to your posts Sulekha! Interesting no-theme theme! Let your 26 posts reveal the mystery. Good luck! Yes at times letting yourself go with the flow does work. Will look forward to your posts then! So we take your theme to be "go with the flow" 😀 Don't you worry, it is going to be fun. You know what? The most important thing about this whole challenge is to have fun! You can do it! Doesn't matter if you have a theme or not. Enjoy yourself! Not a bad idea at all.. keeping it spontaneous. I'm struggling with my theme already… The Qs, the Xs and the Zs..
Haa dont we all luv secrets :-D.
Hi 5 on that from another who is theme-less! You are an A-Z veteran so that is why you are "winging it." No sweat. I'm sure it will be awesome. Secret theme? That's a good one!